White dog poo doesn't always indicate an immediate problem, but if you notice your pet's stools are far lighter in color than normal, it's worth checking into because these animals don't usually have white poop. Depending on the cause, you may need to make some changes to ensure your pet's health. 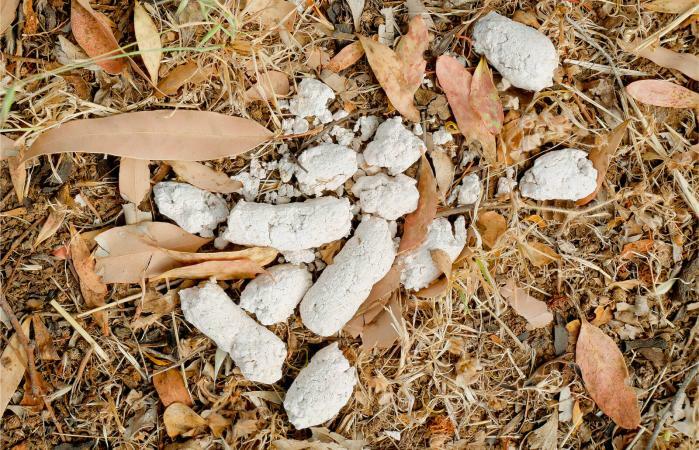 There's more than one reason dog poop is white, and a pile laying in the yard and baking in the sun tends to turn white as it dries and breaks down. However, white dog poo can also be caused by a diet with too much calcium or ingesting items that aren't edible, such as a roll of paper towels. Medical conditions involving the pancreas, liver or gallbladder can also lead to white or grayish-colored feces. Mold on stools left in the yard too long can also give your dog's poop a white coloration. According to an article published by Dr. Karen Becker, dogs that eat foods which are high in minerals produce stools that turn light within 24 hours and break down quicker than brown stools. If a dog's diet contains too much calcium or bones, freshly passed stools are often white and have a chalky texture. This is sometimes the case with dogs fed a raw diet. Feeding less ground bone in a raw diet. Feeding one teaspoon of canned, plain pumpkin per every 10 pounds of your pet's weight with his daily meals. Feed a half teaspoon of coconut oil for every 10 pounds once or twice a day mixed in your dog's food. You should also discuss your dog's constipation with your vet to make your dog more comfortable and to avoid obstipation. Make sure your dog has plenty of water and drinks regularly. Add some canned dog food to his diet to increase his water content. Increase his exercise level as this can help him defecate. Add probiotics made for dogs to his daily meals. Feed a dog food with higher fiber content. Combine a quarter teaspoon of ginger with a half-cup of broth (chicken or beef) and mix with his food. Use no more than a half teaspoon per meal of olive oil on your dog's food. If home remedies do not solve the problem, you veterinarian prescribe laxatives for dogs. The most commonly prescribed laxatives are Laxatone, Lactulose, and Colace. Laxatone comes in a gel form and is administered by placing a small amount of your dog's paws or nose and letting him lick it off and swallow it. Lactulose is a liquid that you can give to your dog mixed in water, milk or fruit juice. Colace comes in tablets, capsules, syrup and in enema form. It does not require a prescription but should only be used under the supervision of your vet. While there are some laxatives made for humans that can be safe for dogs, do not give your dogs anything not made specifically for dogs without discussing with your veterinarian. Dogs are notorious for eating things they shouldn't. Inappropriate items like paper products, when consumed in large amounts, can lighten the color of your dog's stools and may even make them appear gray or white. To combat this issue, try to limit your pet's access to anything he likes to eat other than his regular diet. For example, keep the bathroom door closed so he can't reach the tissue roll and keep boxes of tissue on a shelf. Eating inappropriate items can be a random issue caused by curiosity or boredom, but if it's an ongoing problem, the dog could have a condition known as pica. In a case like this, it's best to consult a veterinarian who will test your pet for underlying conditions that cause pica and treat your dog either with medication, therapy or a combination of both. Exocrine pancreatic insufficiency is a condition where the pancreas doesn't produce a sufficient amount of digestive enzymes and without those enzymes, a dog's stools become clay-colored. This ailment is typically treated with medication and a change in diet. Liver disorders that cause a lack of enzymes or bile production can lead to grayish-white stools, a lack of appetite, weight loss, and jaundice. These are just a few signs the liver isn't functioning normally. A veterinarian will run multiple tests to determine an accurate diagnosis, including a blood chemistry panel, complete blood count and bile acid test among others, and the treatment plan will be decided accordingly. Bile duct obstruction is another possibility. Bile is produced by the liver and stored in the gallbladder until it is released into the small intestine via a small duct to aid digestion. When the bile duct is blocked, the lack of bile in the stools causes them to appear pale gray rather than brown. This condition is treated according to the disorder or trauma that caused it and may include the use of medication or surgery to relieve the obstruction. 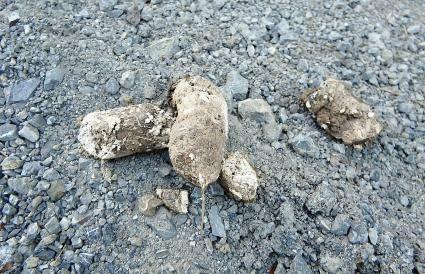 You may notice that your dog's poop has a white, fuzzy substance on it. This is actually mold that grows on feces if it's been outside too long, especially in damp, humid weather. If you're noticing this often, step up your regular poop scooping schedule to avoid it. Your dog's stools can tell you a lot about his health. If they're brown and well formed, there's usually nothing to worry about. 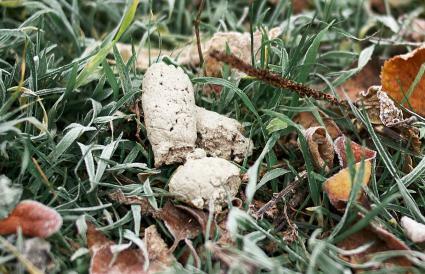 If your dog's poop is white or gray, it's time to do a little investigating. Collect a sample in a sealable plastic bag and take it to your vet for an examination. You just might catch a health problem before it becomes a serious issue.